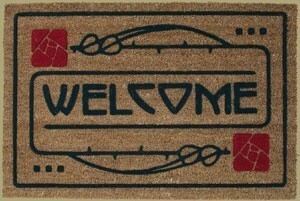 Grace the entrance of your home with our beautiful Arts & Crafts welcome mat. 100% natural fiber embedded into heavy rubber backing with raised flocked design. This Rose and Stem design was inspired by the Dard Hunter classic design for many Roycroft publications including A Message to Garcia. Approximately 18"x29"